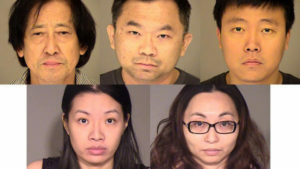 Two Los Angeles County men pleaded guilty Tuesday for their roles as drivers in a multi-million dollar prostitution ring linked to the classified advertisement portal Backpage.com and involving dozens of female Chinese nationals. Juiyin Cui, 63, and Runan Xia, 33, appeared before Ventura County Superior Court Judge Patricia Murphy for a preliminary hearing, but instead both men pleaded guilty. Cui, of Rosemead, pleaded guilty to three felony counts of pimping, one count of conspiracy to commit a crime and two counts of money laundering. He also admitted to overt acts related to the conspiracy charge. Cui will be sentenced to eight years and eight months when he appears again in court on April 19, Senior Deputy District Attorney Melissa Suttner said. Xia pleaded guilty to one felony count of conspiracy to commit a crime and also admitted to the overt act related to the charge. Xia, who had a “minor” role in the prostitution operation, will be sentenced April 18, Suttner said. Cui and Xia are among five individuals who were arrested in August in connection with the prostitution ring that operated in hotels and motels in Los Angeles, Riverside, Tulare and Ventura counties.